This particular lanyard is an expanyard style, twin-leg model which comes with one 19mm snaphooks and two 52mm carabiners. When relaxed, it stays close to the user's body which reduces the possibility of trip and snag hazards. It is designed to stretch to a 1.8m length and is 1.5m in length when relaxed. 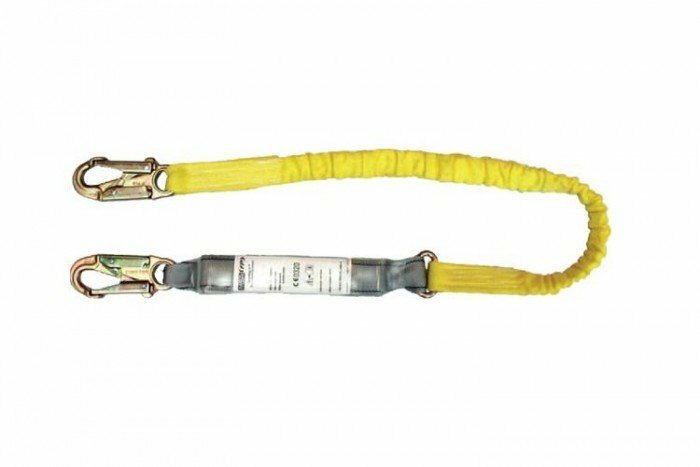 The Sure-Stop EN Energy-Absorbing Lanyards from MSA’s range of fall arrest equipment are precisely engineered and manufactured using only the components that meet a high quality standard. The compact, tear-tape energy absorber design of the lanyard ensures that the fall arrest forces transmitted to your body do not exceed 6 kN. Other features of the Sure-Stop EN Energy Lanyard include a clear energy absorber cover which protects product labels from damage and make inspection easier to carry out. The Sure-Stop EN Lanyard is certified to EN 354, EN 355.